When the German guitarist Volker Kriegel died of cancer in June 2003 according to the general rules of the music industry you could well expect republications of his music to be put out pretty soon. Sadly enough it was only his death that brought him back into the press and the minds of people again as a musician. Over here in Germany he was mostly working as an illustrator for books for children in the past years, and every now and then a review of one of his books at least mentioned that he once had been a well-known musican. This way I found some printed material for his obituary in Aural Innovations (#24, July 2003) but failed to find any of his original works to be able to add more than some general and rather superficial descriptions of his music from my memory. So, it was more than overdue that at least some of his original works should have been reissued - since quite some years. What you get now is not an overload of CD republications of his original releases but his first and maybe most important solo LP as one in a row of re-releases of several artists of the famous German MPS Jazz label from the Sixties and Seventies, the copyright of which is now owned by Universal Germany. So, you can say that in this case the reverence has been preserved by the music industry. And they invested a lot into the remastering and the sound preservation of the music, which is simply excellent. What is important about Volker Kriegel and this specific release? You can say that Kriegel has invented what later was called Jazz Rock already as a member of the Dave Pike Set, the band of the US vibraphonist Dave Pike who lived in Germany in the late Sixties. 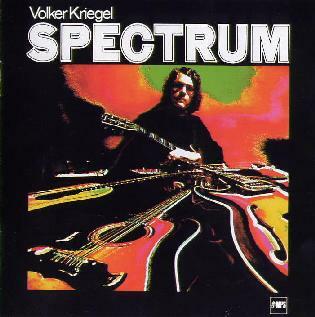 "Spectrum" originally was conceived as a "guitar showcase", as the liner notes say, a real "solo album" to establish a new guitar star besides John McLaughlin, Terje Rypdal and Larry Coryell who were the masters of this genre at that time. Fortunately enough "Spectrum" turned out to become a real band release due to the musical experience of such collaborators as John Taylor on e-piano, Peter Trunk on upright bass, bass guitar and cello, Cees See on percussion and Peter Baumeister on drums. What you get here is a testimony of early Seventies music from Germany besides what is commonly known as Krautrock, which - hands down - in very many cases did not match the versatility and liquidity of its British and US examples. But on the other hand you find almost psychedelic elements in this music that were rather unknown in Jazz productions at that time. So, the whole thing turns out to be something very special: a general level of musical ability that by any means matches the international standards of that time without any "exotic bonus", and on the other hand a very experimental and varied anticipation of Fusion and World Music - and hence literally "exotic" - at the same time. The CD starts with "Zoom", a riff-laden and really "rocking" opener with sitar and tribal percussion that back up a fierce guitar explosion, leading over to "So Long, For Now", a rather portato style Jazz ballad with an excellent piano solo besides Kriegels almost conventional guitar lines. "More About D" quite harmlessly starts with smooth and gentle percussion and then oscillates between (what later became) Jazz Rock standard phrases, Free Jazz elements and general free form passages that are almost impossible to file into any musical category, and you can well imagine live versions of that tune that lasted pretty much longer than the recorded ten minutes on this CD. Next is "Suspicious Child, Growing Up", a most beautiful Country Blues (!) - the Allman Brothers’ "Jessica" comes into my mind. "Instant Judgement" again profiles Free Jazz elements and gives much room to excellent soloistic escapades of all contributors - a tune that wouldn’t have sounded false on Larry Coryell’s "Spaces". "Ach Kina" shows rather conventional Modern Jazz excellence mixed up with some freaky escapades, retrospectively a most suitable soundscape for those exciting Seventies’ nights filled up with political debates as well as all kinds of hedonism and the frequent situation when the last glass of red wine of one day was followed by the first cup of coffee of the next (at least some of you will know what I mean)... The CD closes with "Strings Revisited" that comes with a cello solo played in the style of a guitar solo, cello/guitar double lines that sound like what nowadays is achieved with the help of octaver effects, a drum and percussion duo and a beautiful melody line that keeps the whole thing together. Everybody who has read this review to the end is the right person to get this CD. I’m quite aware that you have to be patient to get it via import service as it is not easy to find even over here in Germany where it was released. But you will be rewarded with some excellent music the world had almost forgotten - music that sounds as fresh and exciting as if it had been recorded last night.